 Self aligning gland box.  Both Ductile Iron and 316 S/S valves available.  One piece integral cast body, chest and lugs.  Integral cast in gate wedges minimize flow obstructions.  High quality gate finish for optimum sealing.  High flow rates with low pressure drops.  Integral teflon gate scraper.  Gate guides to support gate.  Wide range of seat options available.  Meets or exceeds the shutoff requirements of MSS SP-81 leakage specifications.  Complies with MSS SP-81 face to face dimensions.  Every valve pressure tested. 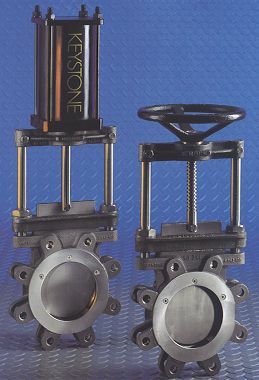 VARCO for all your Keystone K-nife gate valves.